Crane's In The City opened it's doors on July 27, 2010 at 11 East 8th Street in the beautiful downtown Holland. 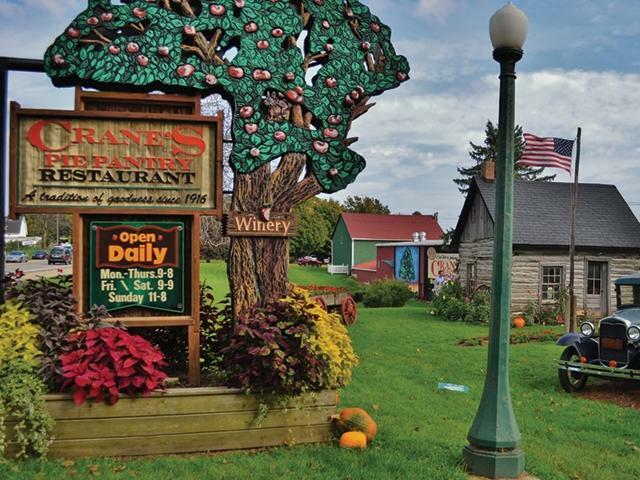 Chad & MaryJo Creevy are co-owners with the original restaurant, Crane's Pie Pantry in Fennville, MI (MaryJo is a niece of the original founders, Bob and Lue Crane). Our urban restaurant brings all the fun foods from its rural roots like Sloppy Joes, homemade soups and chili, and, of course, their famous homemade pastries. Our menu is full of delicious Salads, Sandwiches and Soup that are great for lunch or dinner. You can sit and dine with us in-house or take your food to go! We are speedy! There is seating for about 35 in-house, including a dozen patio seats outside. We are proud to serve Crane's homemade pies. Our selection includes over 12 fruit pies and crisps, apple-walnut cake, strudels, apple dumplings, and the famous cider donuts made fresh daily in-house. We also offer coffee and espresso drinks of all sorts, and serve the delicious Plainwell ice cream atop your favorite slice of pie, or all on it's own. We also have Crane's classic line of blueberry and raspberry preserves, and of course apple butter, local honey, hot fudge and caramel sauce. We've had a great crowd since we opened back in 2010. Downtown Holland is a fun place to be! Eighth Street seems to be the center of activity, and even in the snowbelt, there is always something going on. Come visit us!